"The first dream had to do with Geronimo, the feared Apache Shaman who was responsible for much bloodshed on this land. In the dream, I was shown old newspaper articles and writings depicting the violence and bloodshed that was brought about by his hand. There was a spirit of violence involved. He was so brutal that he was feared by his enemies. 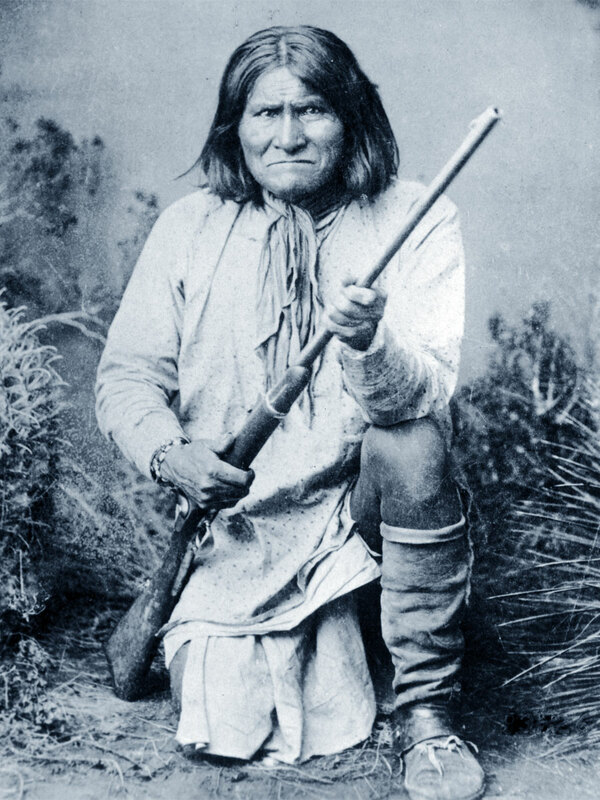 His Chiricahua name was Goyahkla (One Who Yawns), but his Mexican enemies gave him the Spanish name Geronimo. He had a deep hatred for Mexican soldiers, in part for them killing his family. In the years that followed, he raided the area know today as the American Southwest (New Mexico and Arizona). He relied in supernatural power as a warrior. In the second dream I had, I saw a man plottingto kill many people. He looked wild and had a plan to kill people. In the dream, I heard him saying out loud: "STOP ME, STOP ME!". He seemed to be under demonic control, mind control or both. He had a rifle and was methodically following a plan. He seemed to following a certain group of people. I don't remember who the people where that he was after. There was a spirit of violence around him. He looked to be middle aged like in his 40's. He was using an older van. I saw him park the van and was looking for a place to do the killing. I was shown three computer screens that he was using to plan his evil deed." Then I woke up. I have received much confirmation regarding what I was shown. We received a piece of information concerning a portion of this dream from one of our intercessors which may have partially solved the puzzle of why I was shown Geronimo in my prophetic dream. According to an article (see link right under dream confirmation) from the New York Times, the descendants of Geronimo sued Skull and Bones, a secret society of Yale University, charging that its members robbed his grave in 1918 and have kept his skull in a glass case ever since. After you read the article things will begin to come together and make more sense as to why I was shown Geronimo in the dream. We know that the leftist Clinton Democrats do not want Kavanaugh on the Supreme Court. We also know that there are many who are a part of the Deep State (Democrats and Republicans) who belong to this secret society. Also, several intercessors wrote in confirming this prophetic dream. One of them shared the need for repentance for what was done to native americans in this nation including Geronimo. The fact that Geronimo's tomb was desecrated and his skull stolen (see article) by Skull and Bones and presently in their possession, speaks volumes as to this secret society's involvement in what is about to take place in this nation. The enemy is surely using this argument in the courts of heaven to release violence and bloodshed on this land. We need to repent for the sins of this nation against Geronimo and the native americans, and pray with this knowledge to counterpetition the Heavenly Court for a favorable ruling on this matter. There is a spirit of violence and vengeance associated with Geronimo that is being loosed on this nation. It is linked to demonic, shaman, withcraft power that will be behind this spirit seeking to kill innocent people. There is going to be a man that will be controlled by this spirit who will try to kill innocent people in the very near future. Although I was not shown who the people were, I have a gut feeling that they might be Republican Senators, their families who he feels hatred and animosity towards. This man is not an isolated case. There will be others as this spirit has now been triggered in America because of the Kavanaugh hearings, although it was already fueled by hatred against President Trump and those who support him. This is an urgent call to all the spiritual intercessors in this nation and abroad to intensify your prayers and target this before innocent people are killed. I encourage all believers in Christ Jesus to continue to cover our President, his family, senators and their families, congressman and their families, all judges and justices on the Supreme Court. Cover all schools and public places where many people might gather in the coming months. Do not be afraid, however do not take this prayer alert lightly. Prayer is powerful and prayer changes things. I believe that this was shown to me so that we could pray against it and thus stop this senseless loss of life. Stay tuned as I believe there is probably more to this. Be in Shalom. James 5:16-18 "Confess your offenses to one another, and pray one for another, that you may be healed. The insistent prayer of a righteous person is powerfully effective. Elijah was a man with a nature like ours, and he prayed earnestly that it might not rain, and it didn't rain on the earth for three years and six months. He prayed again, and the sky gave rain, and the earth brought forth its fruit." John 14:29 "And now I have told you before it come to pass, that, when it is come to pass, ye might believe." 1 John 5:14-15 "And this is the confidence that we have in him, that, if we ask anything according to his will, he hears us: And if we know that he hears us, whatsoever we ask, we know that we have the requests that we desired of him."